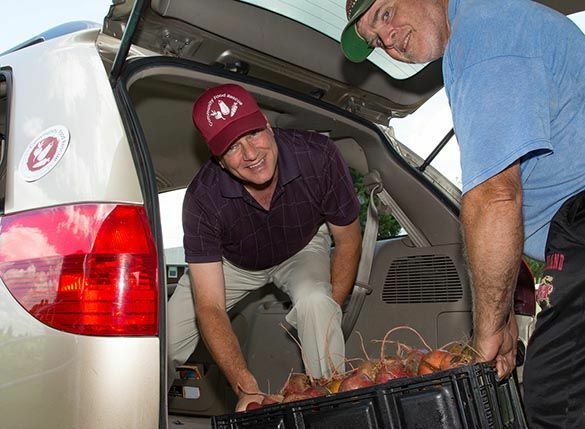 Community Food Rescue’s success depends on volunteers who can transport food from businesses to food assistance organizations. Join us if you have a vehicle, a good driving record, and a few extra hours to transport food on a regular, weekly basis or just for a one-time food run. You choose the food runs that fit your schedule. Follow the easy steps below to get started with our free food matching app, ChowMatch. Click on the ChowMatch button, enter your email and create a password to sign up. Vehicle size (sedan, SUV, truck). Select the largest vehicle available if more than one. The maximum distance in miles that you want to travel between your residence and the donor. Tip: Once you have created a profile, download the ChowMatch mobile app for Android or iPhone to sign up for food runs from your smart phone. Volunteers play an important role in maintaining the safety of donated food. We ask that all volunteers review safe food handling guidelines and view our save food handling video here. TIP: The Food Safety Guidelines are also available to download as a PDF. All volunteers will take a short online quiz as part of the signup process. (You’ll want to read the Food Safety Guidelines and watch the videos first!) The quiz is approximately 20 multiple choice questions. You will receive an email confirming that you’ve passed or if not, you can review and take the quiz again. Once you complete your profile and pass the safe food handling quiz, your account will be activated. You will receive a CFR cap and car magnet in the mail. Please display these for identification on each food run. When a business posts a food donation, it is automatically matched with a food assistance organization. All volunteer food runners within their selected distance and appropriate vehicle size will receive email and/or text requests for transportation. The first volunteer to accept the food run will get it. Once a volunteer food runner accepts the run, the run is scheduled and all parties are notified with details and contact information. CFR works closely with the Montgomery County Department of Health and Human Services to develop safe food handling protocols, including using a food donation tracking form. Print and take a copy of the Food Donation Tracking Form on every food run. Download a check list of items to take on a food run. Leave the completed tracking form with the food assistance organization; they will keep it on file to satisfy health regulations. After a food run, login to your account and rate your food run experience online. Go to Volunteer>my food runs> select the specific run. Click on the star icon. Rate your food run experience. Your feedback will improve the food run experience for everyone and helps CFR improve the system overall. Read our County-approved Food Safety Guidelines for handling and transporting recovered food, and download helpful forms and check-lists. Learn how the Good Samaritan Act protects food recovery donors from liability. Who can volunteer as a food runner? What's required? We welcome individuals, families, and groups to volunteer as food runners if the driver is 18+ years, has a good driving record and auto insurance, a clean vehicle, and a few extra hours. Volunteers choose regular weekly food runs or one-time or occasional food runs to fit your schedule. You choose the distance in miles between your residence and food donors within Montgomery County in which you’d like to pick up food. 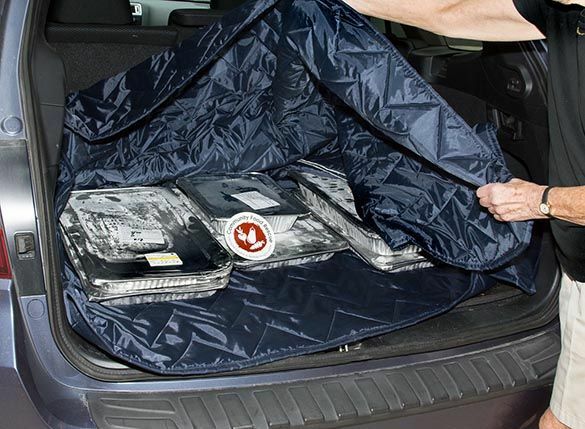 How do I learn how to handle and transport food safely? Food Safety is critical for the well-being of all food recipients. We ask that all volunteers review safe food handling guidelines and view the food runner training video as part of signing up – you can do both here. After reviewing, you will take a short multiple-choice quiz during the sign-up process. Once you successfully complete the quiz, CFR will activate your account and you will begin receiving food run requests. If you don’t pass the quiz the first time around, you can review the information and take it again. How do I get a food run? 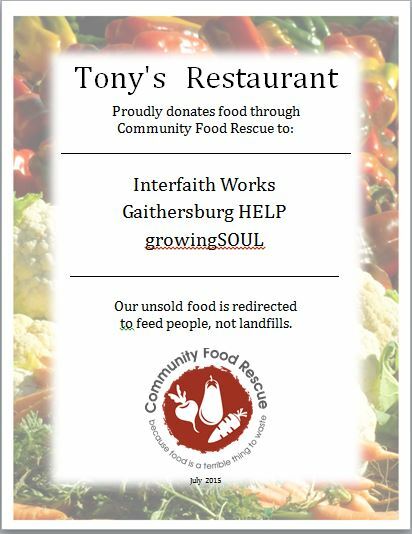 When a business posts a donation, it is automatically matched to one of the CFR network food assistance organizations. Then all volunteers with appropriately-sized vehicles and within the distance specified to donors will receive an email request with the details including timeframe, location and any special instructions. The first volunteer to accept the food run will get it. As soon as a volunteer food runner accepts the run and all parties are notified with details and contact information. TIP: Check for all available food runs in your web account or with your mobile app, in Your account>Volunteer>Available Runs. What do I need and what is provided for safe food handling and transportation? All active volunteers will receive a CFR cap and car magnet in the mail. Please wear your CFR hat and place the magnet on your car during food runs. You will need to print a Food Donation Tracking Form to complete and take on every food run. Have the donor, recipient, and yourself sign the form and leave it with the recipient for their files to satisfy health regulations. Download a list of items to take on food runs. Contact the CFR administrator to borrow thermometers, thermal blankets and produce crates for those who have regular weekly food runs. You may want to invest in an instant read thermometer (less than $10) if you regularly transport prepared foods. What do I need to do after a food run? After a food run, all participants are asked to rate their food run experience. Can students participate for Student Service Learning (SSL) hours? Unfortunately, no. Due to the nature of food running being about transportation, we don’t have a way to supervise or verify that this work was accomplished by the student, so this activity doesn’t fit the criteria needed for SSL hours. Do you have information about the benefits of being a food runner? Yes! Download our Food Runner Brochure to learn more. We celebrate food donors and recipient organizations working together. Your business will be listed on the CFR website, in blog posts, E-newsletters and social media. Donors can also request a printer-friendly certificate that recognizes the organizations that receive their donated food. Participating businesses are also encouraged to become verified food donors through Food Recovery Verified.